Sometimes, kids can be reluctant to put or keep their shoes on. So, choosing a fun light up pair is a sure fire way to encourage them to rush to put their shoes on in order to get out the door! Kids will be sure to stand out from the crowd with their new shoes, which are even more fun to use in the evening when it’s getting dark outside. There are a variety of styles available, so we are here to help you choose the best of the best. You will find something cool here that your boy is sure to love, no matter who is favorite character is or what colors he prefers. 2.0.1 What are the Different Styles of Lights Used in Shoes? 2.0.2 Are Light Up Shoes Waterproof? When buying any shoe, the most important thing is that it is comfortable. It’s best not to buy the cheapest shoes you can find, as often they are made from inferior quality materials which can sometimes rub and cause blisters and discomfort. Look for a shoe which is strong enough to support your child’s growing feet, whilst also offering flexibility for them to move around comfortably. The next thing to consider is the design of the shoe. Kids can be fussy about their footwear, so it often helps to look for a pair which feature characters they love, especially for younger children. You might like to think about the color of the LED lights and choose their favorite shades too. Cleaning is another important aspect to think about. Make sure the shoes can easily be cleaned – as a parent of a boy you’re sure to know what kind of mess they can get into! On a related note, it is a good idea to choose a pair which are waterproof to ensure your boy’s feet stay warm and dry in all weather conditions. Here, we review some cool and fun light up sneakers for boys of all ages. No matter what style you are looking for, you will find something he will love here. These boys light up sneakers come in toddler, little kid and big kid sizes, so they are ideal for boys of all ages. They also come in a variety of styles and colors, so there is something to suit all tastes. The shoes are made from a breathable material, ensuring kids’ feet remain cool and comfortable when wearing them. They also have a rubber sole which is waterproof and offers good grip. The LED sneakers come with a USB cable for charging the lights. There are over 10 different lighting patterns, meaning boys will never grow tired of wearing these shoes! Some of the light patterns are colored, whilst others are white. Some offer still lights whilst in other options the lights will flash in different ways. The lights are really bright and will make sure your boy stands out from the crowd. They look excellent when worn in the dark! These kids flashing shoes are lightweight and breathable to ensure they keep the feet feeling comfortable during use. They come in sizes from 8.5 toddler right up to big kid size 5, meaning they fit boys of all ages. There are 7 static color options and 4 color changing patterns, meaning there is plenty of variety so kids won’t get bored. No matter what they are wearing, they are sure to find the perfect lighting style to match their look. The boys LED shoes include a USB charging cable – a full charge takes around 2 or 3 hours which then gives up to 11 hours of use. Beside the USB charging port, you can find the hidden switch which changes the lighting patterns. A quick, single press will cycle through the different lights, whilst a longer press will turn them off completely. The soles of the shoes are waterproof, allowing them to be worn when it is raining lightly. However, it’s best not to wear them in heavy rain or snow. These boys light up shoes are made from synthetic leather to give a durable and water-resistant finish. They come in a choice of 10 great colors, including bright red and metallic silver. Like the shoes above, this pair comes with 11 different lighting modes, with a range of static and flashing modes to choose from. Kids will be spoiled for choice with the range of great colors available! The shoes feature a thick rubber sole which is anti-slip. The lights need to be charged using the USB port inside the shoe. Charging will take 3 hours and you can expect 8 or more hours of use from a single charge. Pressing the button next to the charging port will change the lights, and holding this button for 5 seconds will turn them off. These shoes are intended to be worn only on dry days as they are unfortunately not waterproof. In order to clean them, they should simply be wiped with a damp cloth. These Skechers kids light up shoes come in a choice of sizes to fit boys aged between 4 – 12 years on average. They come in different color schemes including gray and red, orange and navy and blue and bright green. The shoes are lightweight and flexible, making them extremely comfortable when walking around. The boys light up Sketchers don’t need to be recharged – the lights are activated by walking and have a long lifespan. The shoes are easy to put on and take off, so young kids can put them on independently. Skechers is a great brand which offers high quality, comfortable shoes, and has been trusted by parents for years. Boys will love wearing these shoes, and moms and dads will appreciate how they will match with all their outfits! The Paw Patrol light up sneakers are a great choice for any little boy who is a fan of the popular cartoon. They have a non-marking sole with lights inside. These shoes don’t need recharged, as the lights simply activate as your child walks. To clean the shoes, they can be wiped with a damp cloth, rather than being submerged under water. The toddler boy light up sneakers are a great way to encourage toddlers to keep their shoes on – many toddlers would rather go barefoot! They are officially licensed so you can be sure of the quality. However, they only come in sizes toddler 8 – 10, so if your child is another size unfortunately they will not fit. 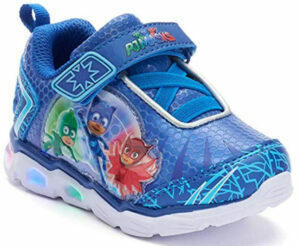 These LED shoes for kids are really trendy and sure to appeal to young boys who love keeping up with the latest styles. They come in a few different colors, including bold red and black with green wings. You’ll find these shoes in sizes 8 toddler thru 5 big kid. The shoes are intended for light use such as walking and playing around outside. They are not intended to be worn during sports of for other heavy use. The wing shoes include a USB charger, which takes around 3 hours to fully charge up the shoes. After charging, expect up to 11 hours of use before a recharge will be required. Like most other LED shoes, the lights on these are activated using a single press of the button inside the shoe. Continue pressing the button to cycle through the 11 different light programs. A longer press on the button will turn the lights off completely. The shoes can be worn during light rain, but should not be submerged in water. The battery which powers the LEDs must be kept dry in order to keep the lights working. These Skechers light up shoes for a boy come in a huge range of sizes and colors, to fit boys aged between 1 – 12 years old. They come in a typical range of boyish colors such as bright green, black, navy and red. The main part of the sneakers is made from lightweight fabric, making these perfect for spring and summer. They also have a flexible rubber sole which offers good grip. The kids light up Sketchers have long lasting lights inside the sole which are activated when your child takes a step. The shoes are easy to fasten as the laces don’t need tied – they are simply elastic straps. All that needs fastened is the top Velcro strap, so you can be sure the shoes will offer a snug and secure fit. Kids will love to run and jump with these shoes on in order to see the fancy lights flashing! These Batman light up shoes are perfect for boys who love superheroes. They come in the classic Batman colors of black, yellow and grey. The shoes are comfortable to wear with the padded collar and cushioned sole, which is ideal for toddler’s growing feet. They also feature a rounded toe and breathable material for optimum comfort. The toddler boy light up shoes are activated with each footstep, meaning there is no need for a charger. They feature a simple Velcro strap to fasten, as well as elasticated laces to hold the shoes securely on the feet. There’s also a loop on the back to help toddlers pull their own shoes on by themselves. Boys who are sometimes reluctant to wear their shoes will love wearing these and won’t want to take them off! If your boy always wants to wear his LED shoes in the winter, these rain boots are the perfect solution. Many LED light shoes for kids are not fully waterproof, meaning they cannot be worn in heavy rainfall. With these light up boots, boys can jump in puddles without parents worrying about the lights becoming damaged. The boots come in sizes from toddlers size 5 right up to big kid size 3. They also come in a huge selection of colors and patterns – 25 different choices to be precise! The boots feature looped handles to help younger children easily pull their own boots on. They’re also very durable and comfortable to wear, and will keep your child’s feet warm and dry all day long. These PJ Masks sneakers are sure to encourage toddler boys to put on their shoes and enjoy going outside. Like many toddler shoes, they include elasticated laces and a single Velcro strap for easy fastening. They are made from light and comfortable synthetic material to ensure toddlers’ growing feet are protected all the time. The lights on these sneakers don’t need recharged, but they offer an excellent lifespan. The lights look great with the sneakers, as there is one for each color of the PJ Masks characters – red, green and blue. Some parents feel the shoes are a little on the small side, so perhaps going a size up might be a good idea. These Lightning McQueen light up shoes are the perfect choice for any young fan of Disney’s Cars. They fit sizes 6 – 12, which is fine for most young boys. The shoes include elasticated laces and a simple Velcro strap making them easy to put on and take off. They are made from faux leather with a rubber sole, making these sneakers both comfortable and durable. The Cars boys shoes have a mid-ankle height, so they offer plenty of support. Boys will love the cool Lightning McQueen detail on the side, and of course the flashing light located inside the tire. If your son is reluctant to wear shoes, you can be sure that he won’t want to take this pair off! In our opinion, the Skechers Hypno Flash are the best light up shoes for boys. Skechers is a great brand which is known for producing high quality footwear which is both stylish and very comfortable. We love the look of these shoes, and they are also made from excellent materials to ensure they last for a long time. They’re easy for kids to put on and take off by themselves thanks to the simple fastenings. The shoes are also easy to use as you don’t need to worry about recharging the LEDs, simply put them on and start stomping! What are the Different Styles of Lights Used in Shoes? Basic light up shoes will have a single color of light which activates when your child walks. Some of the more recent designs have USB ports to charge the lights. The lights can also be turned off if they’re not required, and there is the option to choose from different colors. This can be fun, as your child can choose depending on their mood that day or choose something to match their clothes. Some shoes have the option to change the lighting pattern too – they can either remain on constantly or they can flash. Most shoes use LED lights. Are Light Up Shoes Waterproof? It depends on each individual pair of shoes so it’s best to check with the manufacturer. In general, most are waterproof so you don’t need to worry about the lights being damaged by water. Of course, they should not be fully submerged underwater, but wearing them when it’s raining shouldn’t cause any problems. If your LED shoes have a battery which needs recharged, as long as this stays dry there should be no problem. It is extremely important to make sure your child’s shoes fit properly, as poorly-fitting shoes can damage the feet and lead to problems later in life. Shoes which are too big can rub and cause discomfort, as well as lead to an increased likelihood of tripping. Those which are too small can cause even greater problems. They can hinder circulation in the feet and can even lead to ingrown toenails which will cause a lot of pain. Be sure to take your child to have their feet measured on a regular basis to ensure you are buying the correct size, and replace shoes which are too small straight away. Children’s feet continue to grow and develop often until the age of 18, so even when they are a teenager, they will still need their feet checked often.